Buddhism began to take root as the principal religion in Japan during the seventh century AD, and since Buddhism prohibited the destruction of life, the emperor issued a decree in 675 AD prohibiting the consumption of meat. Those caught breaking the decree faced a range of penalties, including death. Over the ensuing centuries, reinforced by this royal decree, the Japanese ate a mostly vegan diet (dairy produce did not feature in the diet – the drinking of cow’s milk was widely regarded as a disgusting notion). This cultural abstinence from meat eating ensued until the nineteenth century, during which time the Japanese also pursued an isolationist policy (for centuries its only trading partners were the Chinese and the Dutch). Significantly, during this period Japan was the only nation on the planet that did not lose a single native species to extinction. It is also no coincidence that for at least a thousand years Japan has been noted for the health and longevity of its citizens. Eventually, Japan’s isolationist policy came under military challenge from the United States of America, which blockaded and threatened to bombard Japanese ports unless Japan opened itself to trade with the west. Under protest, the Japanese government was forced to sign the Kanagawa Treaty of 1854. The treaty opened Japanese ports to trade with the USA, and was quickly followed by similar “agreements” with other Western nations, effectively ending Japan’s long period of self-imposed isolation. At the time, the Americans regarded Japan (and indeed the whole of Asia) as culturally backward and inferior. The opening of Japan’s borders was therefore used as an opportunity to impose “superior” Western customs on Japan, and soon the ban on meat consumption was lifted (although it took many years for the population at large to take up meat eating, because the taboo was by now culturally deep-rooted). No other country has had vegetarianism or veganism legally embedded into its culture in the way that Japan did for so many years. Since 1854 Japanese cuisine has evolved to absorb Western and Chinese influences, but its former isolation from the rest of the world means that it still retains many fascinating, unique ingredients and techniques. This dish is based on an enduring classic of Japanese cooking called nasu dengaku. Miso paste, available from Asian stores and some supermarkets, is made by fermenting soy beans with salt and koji (a naturally occurring fungus). There is a wide variety of miso pastes used in Japanese cuisine – brown, yellow, red and white – the colour and flavour reflecting the other ingredients which are sometimes added, such as barley, rice or buckwheat. Hatcho miso paste is made purely from fermented soy beans and has a naturally sweeter taste, which after a little trial and error, I found to work best in this dish. Serve with a salad of mustard greens or with some plain steamed rice sprinkled with finely sliced spring onions. 1. Heat a frying pan over a medium heat, without oil. Add the sesame seeds and toast for a couple of minutes until they are colouring and start to pop. Immediately tip them out onto a cold place and set to one side. 2. Pre-heat the oven to 180°C (350°F, gas mark 4). 3. In a bowl make the glaze by whisking together the miso paste, mirin, maple syrup, rice wine and water. 5. Pre-heat the grill. Carefully turn the aubergines over on the baking tray so that the flesh side is facing up. 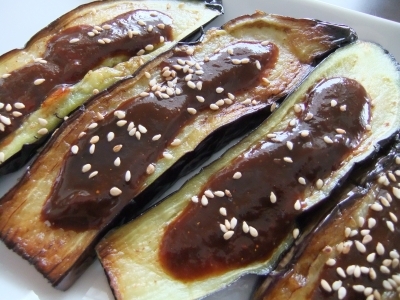 Brush each aubergine half with the miso paste mixture. Place the baking tray under the hot grill for 1-2 minutes or until the glaze on the aubergines is bubbling. Remove and sprinkle with the toasted sesame seeds and serve while still hot. That looks delish! I have a love-hate relationship with eggplant (as its called here in the States) but your method looks amazing! I love aubergines. Will be sharing this recipe with my friends and colleagues. Thank you also for the delightful history lesson. Steve, your recipe is very inviting and one I shall be trying. From a health viewpoint the scientific literature is littered with comparisons of different diets around the world with one universal conclusion, which leaves little to the imagination! Here’s one I just ‘pulled out of the hat’. It was published in 1977 and things have only got worse since then with both the standard ‘Western’ diet and also the detrimental consequences that ‘Westernisation’ has had on the more affluent and cosmopolitan areas of Eastern and Pacific societies. From Robertson TL, Kato H, Rhoads GG, et al. Epidemiologic studies of coronary heart disease and stroke in Japanese men living in Japan, Hawaii and California. Incidence of myocardial infarction and death from coronary heart disease. Am J Cardiol. 1977;39(2):239–43. You and I know very well how the fast-food lifestyle came to these previously healthier societies. I have no need to jump on any bandwagon in this location. Keep up the good work, Steve. Thank you Malcolm for sharing this research, which as you will know is consistent with that of the late Professor Jane Plant. Nice one; we make a different version of this! Do tell me more, Rashmi: I’m intrigued! Fell in love with this in Japan. The dengaku miso paste — miso with mirin, etc (though not maple 😀) — was dolloped on after roasting rather than brushed on before. Like this: http://img-cdn.jg.jugem.jp/c25/724264/20110310_1993263.jpg — well worth trying that way too.